Komelon's 25' inch/engineer scale Monster MagGrip may not be daunting in size but the number of features is extraordinary. 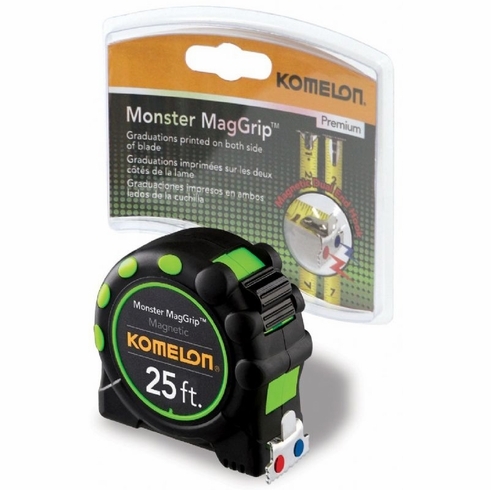 This tape has it all, including a magnetic dual end hook allowing for easier one person measurement and the Monster MagGrip's blade is nylon coated for maximum durability. This tape is a must have for anyone working with or around metal because it makes the job easier. This 25' inch/engineer scale magnetic tape measure is strong, versatile, and extremely durable--what more would you need in a Monster? Oh, it looks pretty mean too.